When it comes to taking surveys online in 2019 one of the easiest ways to be paid is via Paypal. Whilst you can use other payment methods such as bank transfer, cheque or gift cards, Paypal is 9 times out of 10 the fastest way to receive your money. Below we have listed the top 14 Paypal paying survey sites for 2019. All will pay you exclusively via Paypal or it is at least one of the many payment options. The list is in no particular order but all are survey sites we recommend you join if you want to earn money and be paid quickly or even instantly via Paypal. At Swagsurveys you can earn money by taking surveys and answering polls. On top of this, you can also earn extra for playing games, watching videos, searching the Internet, making online purchases and lots more. There is usually a large number of surveys available for you to take paying from as little as 50p up to as much as £40 each. Each survey or task you complete pays in points called SB. Once you have just £5 in your account (which doesn’t take long} you can cash out for a gift card or cash straight to Paypal. 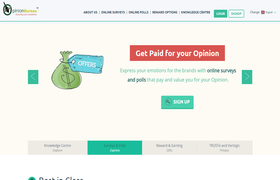 Opinion Bureau is a fairly new survey community which is owned by experienced market research professionals. Opinion Bureau advertises that you can earn as much as £10 ($10) per survey. Once you have £10 in your account you can claim your money. For registering with them today you will get £5 free added to your account to get you started. Prolific (formally known as Prolific Academic) was set up to allow university researchers to easily conduct their research online. The surveys they post to their users are actually posted by university researchers from around the world. This makes them much more fun and interesting than on other survey sites. You will never waste your time taking screener surveys at Prolific. When a survey pops up on your dashboard it means you have already qualified and will not be screened out. All fees are stated in the average amount that you would earn per hour based on the average completion time. This can quite often work out as much as £5 or £10 per hour. Of course, not many surveys will take an hour (some do) but it’s nice that it’s worked out on average. So a £15 minute survey at £10/hour would actually pay £2.50. Although you can join from anywhere in the world the site is mainly focused on English speaking countries. If you are living elsewhere its unlikely you will receive many survey invitations on your dashboard. CFS Panel is another new survey site which is available in the UK and USA. The site was launched within the last couple of years but according to their website already has many thousands of members. 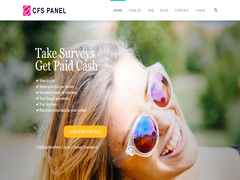 For each survey you complete at the CFS Panel you earn between 50p up to a maximum of £10 each. 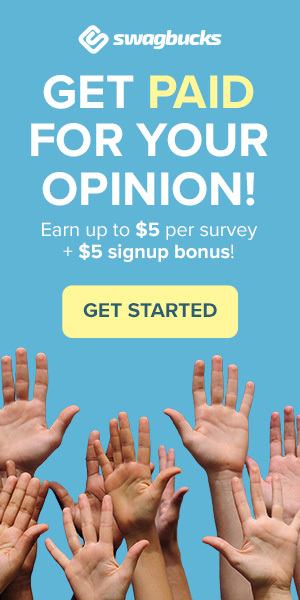 ($0.50 – $10 in USA) There are no complex points systems, each completed survey pays cash. Once you have accumulated £8 ($12.50) you can request a payment which is sent instantly to your Paypal account. This is nice as there are not many sites that will pay you within seconds. As an alternative, you can save up your money and request an Amazon gift card. 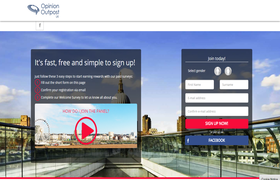 Opinion Outpost are one of the oldest market research sites. Recently they have updated their website which now looks clean, up to date and is very easy to use. 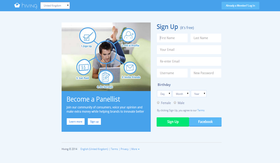 Once you have registered there will email you surveys every week along with more on your dashboard. The minimum to cash out at Opinion Outpost is just £2.50. This can be sent as an instant Paypal payment or via Amazon/iTunes gift vouchers. Hiving is another old market research website having launched way back in 2009. Now in 2018, Hiving is extremely popular with hundreds of thousands of members in as many as 30 countries around the world. By giving your opinions at Hiving you are rewarded with points. Once you have 400 points you can request a £/$4 cash payment. Alternatively, you can save up and cash out more. ACOP is officially the oldest market research website still online today. The site was actually launched back in the 1990’s. ACOP stands for American Consumer Opinion but also caters for people living in the UK and Canada as well as the USA. The ACOP website was upgraded a few years ago and now looks clean and slick. Each survey pays in points with each point being equal to one penny. For the shortest surveys, you will earn an average of 100 points ($1) right up to the highest being 5000 points. ($50) Once you have 1000 points you can redeem your points for cash. Pinecone is a high paying survey site but also extremely exclusive and hard to join as they are usually only looking for a certain demographic. 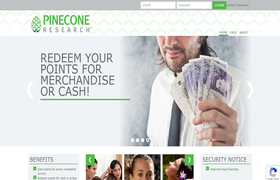 Each survey at Pinecone pays £3 exactly. This can be redeemed for Paypal cash, merchandise and gift vouchers. 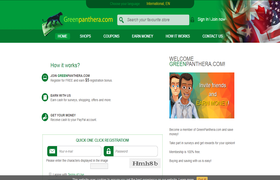 Green Panthera was originally just a survey site but in recent times they seemed to have changed focus and are now a shopping portal as well where you are paid for purchasing online. You will rarely find any surveys on their site but they do send a lot via email which you can take and redeem cash payments. For registering with them you get $5 to get you started. 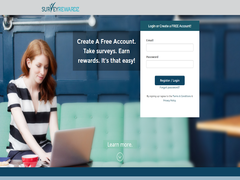 Survey Rewardz is a fairly unique site in that they have a boatload of surveys available to take and a really low minimum cash out amount. Each survey pays cash and once you have just $1 (70p) in your account you can request a Paypal payment. Alternatively, you can wait till you have £5 (£3.50) and request a cheque, virtual VISA card or Amazon gift voucher. 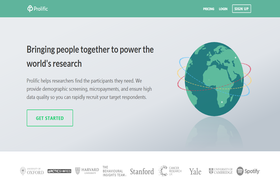 The site works with most of the world’s biggest research companies so they always have a heap of surveys available for you to take. You can claim cash or gift cards once you have just $10 (£7) in your account. All payments are processed and paid pretty quick, usually within just 3 – 5 days. 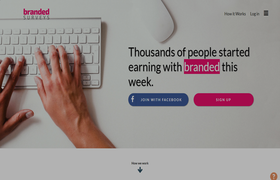 Survey Pronto is a new site where you can earn by completing surveys, offers and taking polls. All surveys are sent via email as and when they become available. Payments are sent quickly once you have accumulated $30. (£21) For joining you get a free $5 (£3) to get you started. Mobrog is a fairly big market research company which is owned and operated by Splendid Research GmbH who are based in Germany. 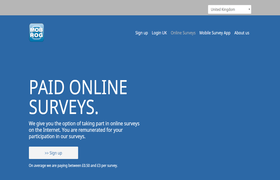 This site gives you the opportunity to take surveys which pay between 50p and £3 each. Surveys are regular and can be taken from your account dashboard. The payout is low at just £4 and sent instantly which is always a plus point! 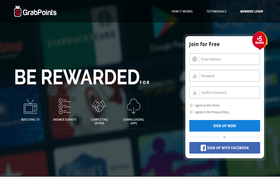 Grabpoints is a rewards (GPT) website which gives you the chance to get paid for many different online tasks. These tasks could include taking surveys, watching videos, downloading apps, completing offers, playing games and more. The site doesn’t host their own surveys but there’s always at least 10 – 25 available at any one time from various research companies. Each one pays between 500 and 2500 points. Once you have registered you can participate through the website or download their Smartphone app. The app allows you to earn extra points such as getting additional points for downloading apps. You can cash out from as little as $2 (£1.40) for gift cards or Paypal cash. Due to the low payment threshold, some people have reported cashing out after just taking 3 or 4 surveys. Payments are usually sent within as little as 48 hours. Great list of sites. Always nice learning about new legit paid surveys sites within the UK. and they offer 25% of your referrals’ lifetime earnings. You’s didn’t mention insta gc,pocket money gpt and prizerebel. !,?